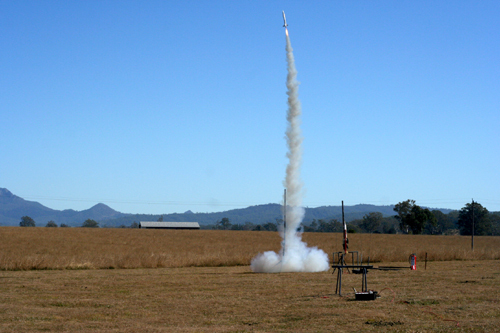 So I reckon we’ve found the coolest free activity in southeast Queensland — watching rockets take off at the Queensland Rocketry Society’s public launch. True, it’s not Cape Canaveral, but it’s definitely worth a visit. 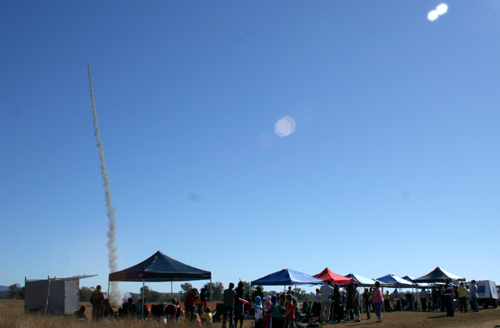 A rocket launch is held about once a month in a big cow paddock way out the back of nowhere", out of major air-traffic zones (although two small light aircraft did fly overhead). 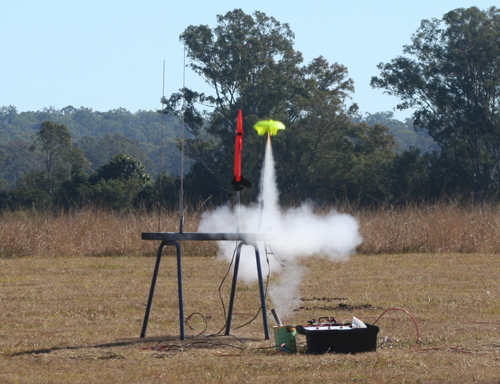 The rockets that took off went as high as 1.3 km (and they have CASA approval to launch to 5000ft/1.5km), so it was important that nothing else be flying around. Clear skies are called for all launches even though the smaller rockets don’t go that high. Jet airliners at that point are at over 15000 feet thus the rockets don’t get even near them. The area where they launch is classified as a “permanent danger area” so all light aircraft know when there is a rocket launch in progress. 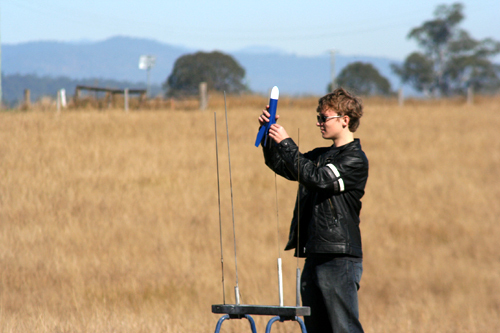 Before a launch, a visual check is made to verify that no aircraft is within 1km of the launch area. There were three "launch pads" set up in the cleared paddock. It was a well-organised event. 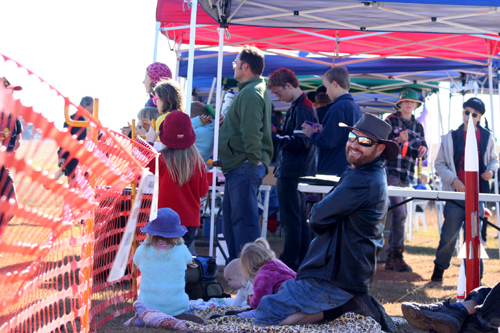 The marquees provided shade for spectators and the rocket enthusiasts who needed to reload their rockets after each launch. Spectators were contained behind an orange safety fence. Initially, Calista was terrified by the noise and so Aisha would cover her ears for her. A trailer was set up by Australian Rocketry, selling rockets, fuel, detonators and parachutes (plus whatever tools and gadgets were necessary), and the business traded successfully throughout the morning. David and I debated launching our own rocket (they start at about $10 — ready to go), but rationale said that we could enjoy other people’s launches (and $) just as much as our own. 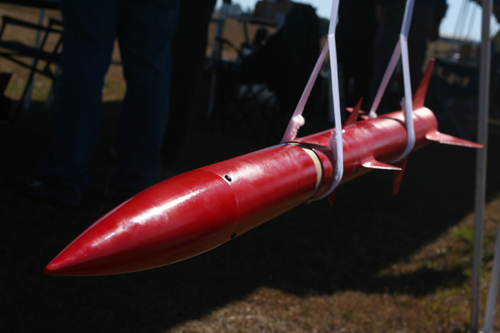 The rockets come apart so they can be reloaded with fuel, wadding, a detonator to release the parachute, and the 'chute. Some of the larger rockets were very noisy. There were only a couple that trailed dark smoke. 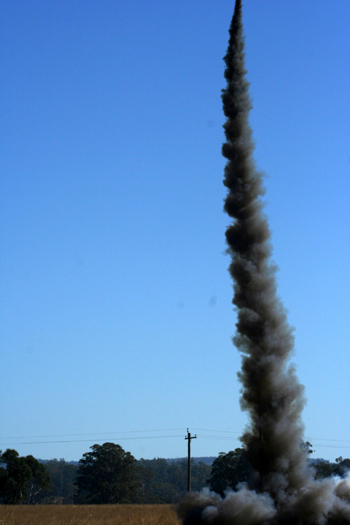 The rockets only had a small parachute so they would come down relatively quickly (rather than drifting very far away). 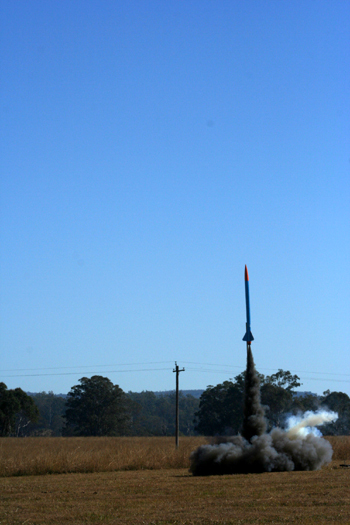 It was a windless day, which made for perfect launching conditions, as most rockets were easily retrievable from the empty cow paddocks all around. Only a couple went so far away that people had get in their cars to drive to get them. One rocket landed very close to where David and I were standing with the kids. I was holding the baby, and David grabbed Calista as we began backing away from where it was coming down. The rockets were pretty light and wouldn’t really cause any damage if they actually landed on us (unless it was one of the big ones). I did see a smallish one land on a vehicle, but there was no damage. 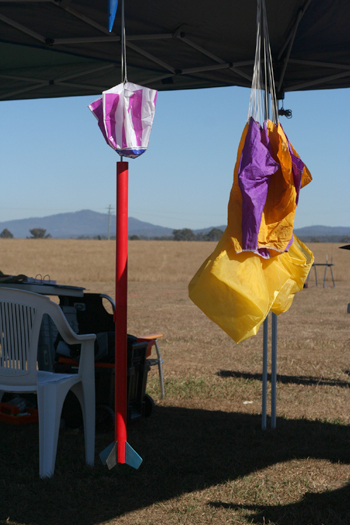 There's a knack to folding the parachutes properly so they bring the rocket down safely. The rockets are all reusable. 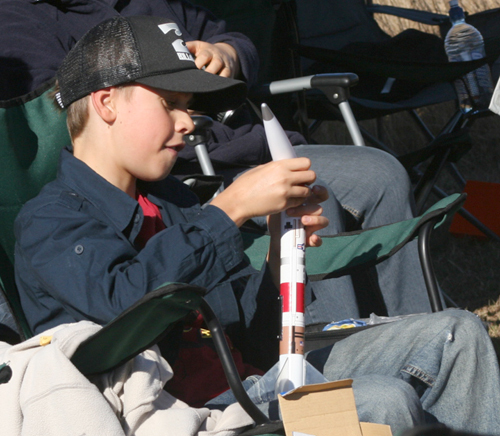 I was pleased to see youngish children participating by loading and launching their own rockets. Loading a rocket on one of the launch pads. Wires led to a table a safe-distance away from where the rocket was detonated. This little UFO was launched by a boy who was about 8 or 9. 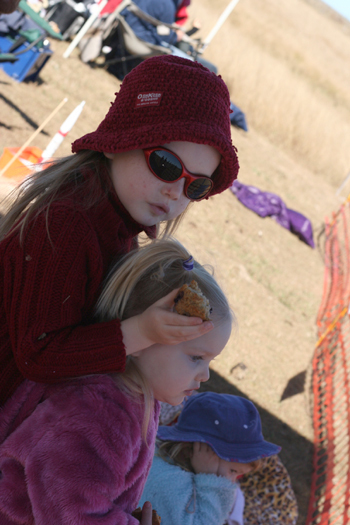 The children who launched rockets were taken as seriously as the adults. I was pleased to see several girls participating. Before each launch, a card had to be filled out with the rocket’s details. An announcer used these details to give information about each launch, which was formally counted down with a “five-four-three-two-…”. 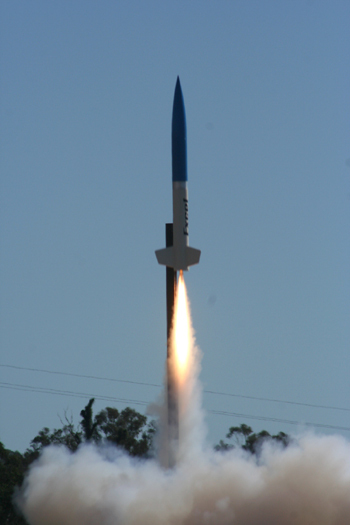 The first time that an individual launched a rocket, as a safety measure, a “heads up” was called. Everyone had to stand up and watch the rocket (presumably so you would see if it went wonky and headed towards you!). Only one rocket went sideways — out into the paddock. Size wasn't a determination on how fast or high the rockets would shoot. Instead, it was about the detonation and fuel. 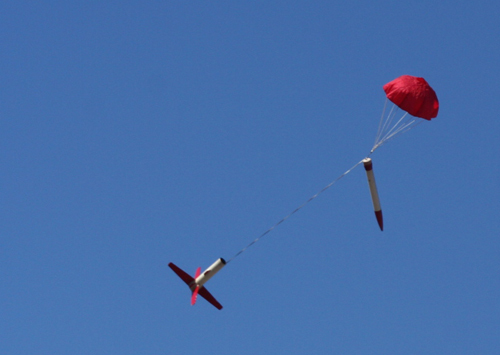 Occasionally, two rockets would be launched simultaneous in a “drag race” — usually by kids. This added extra excitement as we strained to see who went faster or further. And the spectators also liked the prospect of a newly-launched rocket hitting another one’s parachute as it came down. We saw a couple of near misses, which were punctuated by ooh’s and aah’s from the crowd. This one gave a most spectacular show. A fire extinguisher was on hand — just in case. When long-rage rockets were launched, someone had to give a visual affirmation that the airspace was clear. I guess it’s just a safety precaution. We did see a commercial airliner flying overhead at about the same time as a big rocket was launched. 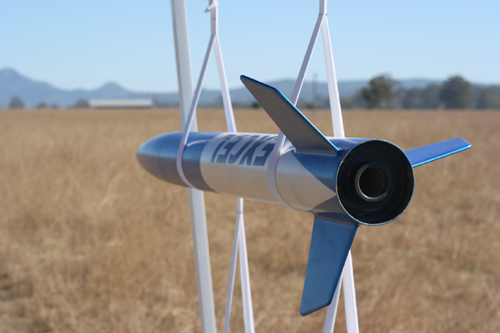 The organisers must have known it was still safe to launch — but from the plane’s point of view, it would have appeared that a ground-to-air missile was heading towards them! 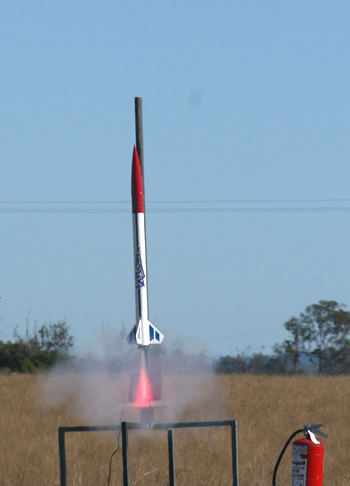 This rocket was about two metres long, which is about as big as they got. 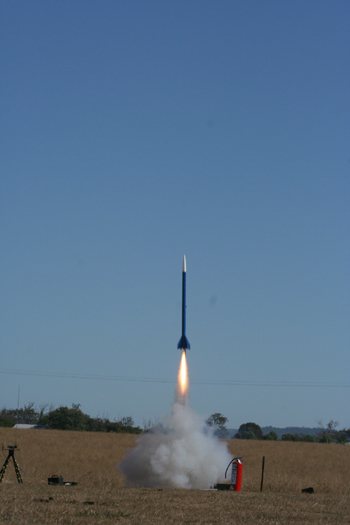 The Queensland Rocket Society’s public launches are the most popular in Australia. About 300 people come to watch the excitement and to learn about the hobby. There were a lot of families who had come out for the morning. (I did see one rocket-mother quietly reading the newspaper in the shade of her car.) But most sat around in picnic chairs, chatting and watching. 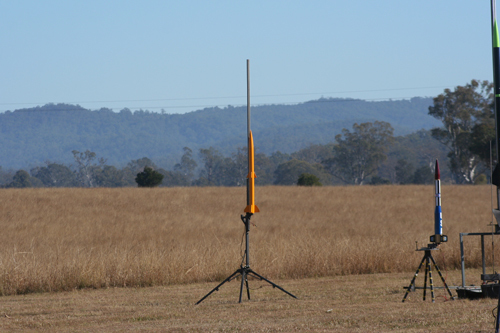 The next public launch is 11th July at Cedar Grove Road, south of Jimboomba. If you can’t make it on that date, there’s one more public launch this year on October 10th. The launching starts at about 8 am. We arrived around 9.30 to find it in full-swing. Rockets were launched almost constantly the whole time we were there, so it was definitely a good show. People started packing up close to noon, which is when we left. 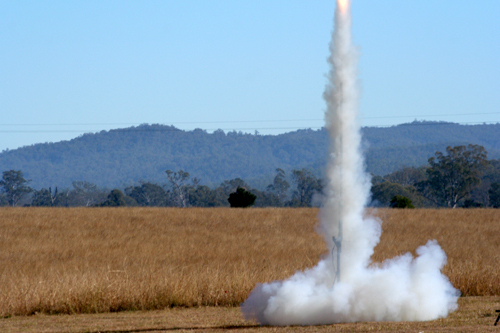 If you’re not in southeast Queensland, you can see if there’s a rocket club near you in other parts of Australia or New Zealand, and of course, worldwide. You never cease to amaze me with the things you guys find to do! Life is much more sedate out in country WA. How do you find out about these things???!!! Wow! This looks awesome, how much would little kids (and husbands) love it??!! I live in SEQ and have never even heard of this! Will have to check out the next launch day! Quite apart from the rockets I was also enthralled by the wide blue sky.Even a short time in HK has made me appreciate our clear air! Thanks so much for stopping by and commenting on my blog. What a fantastic activity to do with the kids. We will have to come out to the next one (the big kid in the house would love this too) I do know about the jumpers ad Jazz in Warwick – have to work out if DH is home or away that weekend. Off to explore our blog.